Serim® GUARDIAN™ Blood Leak Test Strips give a qualitative indication of the presence of blood in dialysate to assist in differentiating an actual blood leak from a false alarm. Test the dialysate that exits from the dialyzer or test dialysate waste fluid collected from the dialysate drain line. 2. NANT Dialysis Technology – A Manual for Dialysis Technicians, 2 Edition (2000), pg 76. National Association of Nephrology Technicians/Technologists, Dayton, OH. 3. Proper mechanisms for assuring disinfectant concentrations for use in hemodialysis. Nephrol News Issues. 1999 Jun. ;13(6):18, 23, 27. Arduino MJ. The blood leak alarm may be triggered by air in the dialysate flow path, a dirty light source or photoelectric cell or by a malfunctioning detector system as well as an actual blood leak in the dialyzer membrane. 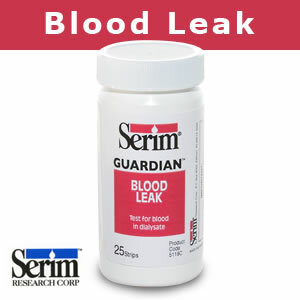 Serim GUARDIAN Blood Leak Test Strips confirm that the alarm was due to an actual blood leak and avoids unnecessary interruption of the hemodialysis procedure. AAMI recommends that dialysis machine blood leak detectors on the dialysis machine activate an alarm if blood escapes through the membrane at a rate of 0.35 mL/minute or more.1 This leak rate calculates to a level of 5.5 mg/dL of hemoglobin in the dialysate (assuming a hematocrit of 25% and a dialysate flow of 0.5 L/minute). Serim GUARDIAN Blood Leak Test Strips are more sensitive than the AAMI- recommended setting for blood leak detectors; the test strips yield positive readings at 1.5 mg/dL hemoglobin. This increased sensitivity provides a safety margin, thereby protecting the patient against blood loss. WHERE do I use this product? WHEN do I use this product? 1. AAMI Standards and Recommended Practices, Dialysis, 2008 Edition, RD5 – Hemodialysis systems, Association for the Advancement of Medical Instrumentation. Arlington, Virginia. Serim GUARDIAN Blood Leak Test Strips are supplied in ready-to-use form. When placed in contact with the sample according to the directions for use (see below), the indicator pad changes color in the presence of blood. Store bottles of Serim GUARDIAN Blood Leak Test Strips at temperatures between 15°- 30°C (59°- 86°F). The lot number and expiration date are printed on the bottom of each bottle.